Possible line-ups: Northampton (4-4-2): Cornell; Goode, Taylor, Pierre, Buchanan; Turnbull, Foley, Hoskins, Bridge; O’Toole; Sordell. Vale (4-3-3): Brown; Clark, Smith, Legge, Crookes; Oyeleke, Joyce, Conion; Worrall, Miller, Pope. James Heneghan’s preview: While the Cobblers head into tomorrow’s game in relaxed mood and with little on the line, visitors Port Vale still have work to do to ensure they’ll be returning to the PTS next season. A remarkably barren run of form saw Vale claim just one win from 17 games in all competitions across December, January, February and March, putting them on a one-way street to non-league as Macclesfield and Notts County gradually made up ground. Seven points but only two places above relegation, the Valiants are still nervously looking over their shoulder at the three teams beneath them, although a recent four-game unbeaten run, including back-to-back victories over Yeovil and Mansfield, has given them breathing space. But defeat at home to Forest Green Rovers last time out has left them a little too close to the drop zone for comfort so they rock up at Sixfields tomorrow desperate for something - a point or, ideally, all three - to ease nerves heading into April and crunch time. 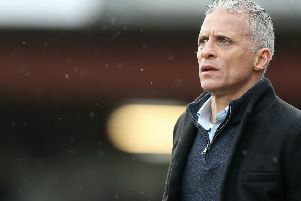 Vale – who slipped into the clutches of League Two 12 months before the Cobblers, going down on the final day of the season – are another club with troubles off the pitch. Indeed, only this week owner Norman Smurthwaite announced his intention to put the club into administration if a buyer is not found by May 5. Smurthwaite told BBC Radio Stoke he will only fund Vale up to the final game of the season as a result of supporter protests about his running of the club. He claims that as much as £600,000 will be needed to keep Vale going until the start of next season. Manager John Askey, who replaced Neil Aspin during Vale’s terrible four-month barren run, has played down off-field distractions and says both his and the players’ full focus is on getting a result over Keith Curle’s men this weekend. While their campaign looks to be on course for a dead end, Northampton themselves have motivation to put things right after last weekend’s defeat at Cheltenham Town, and the expected return of Aaron Pierre only helps their cause. Jordan Turnbull, another key cog in Curle’s machine, could also be back in the squad while Shaun McWilliams and Junior Morias have returned to training this week.